Here’s here. © 2018 CTMG, Inc. All Rights Reserved. Happier times. Frank Masi/© 2017 CTMG, Inc. All Rights Reserved. Maybe an alien parasite from the stars will turn his life around. Not only does being possessed by Venom give Eddie more of a purpose, but it also gives Tom Hardy a chance to explode and escape the monotony of this paint-by-numbers story. He doesn’t just throw himself into the role of an unstable and possessed Eddie Brock but launches himself face first at Mach 2 speed with rockets and fireworks going off around him. He’s smart enough to realize if your character is going to be reduced to forcing tater tots into his face to feed a parasite and puking his guts out in the toilet, you’ve got to go the extra mile of absurdity. Kudos to Hardy for doing a tap dance down insanity lane in scenes where he eats chicken out of the garbage and takes a bath in a lobster tank as he eats living seafood. 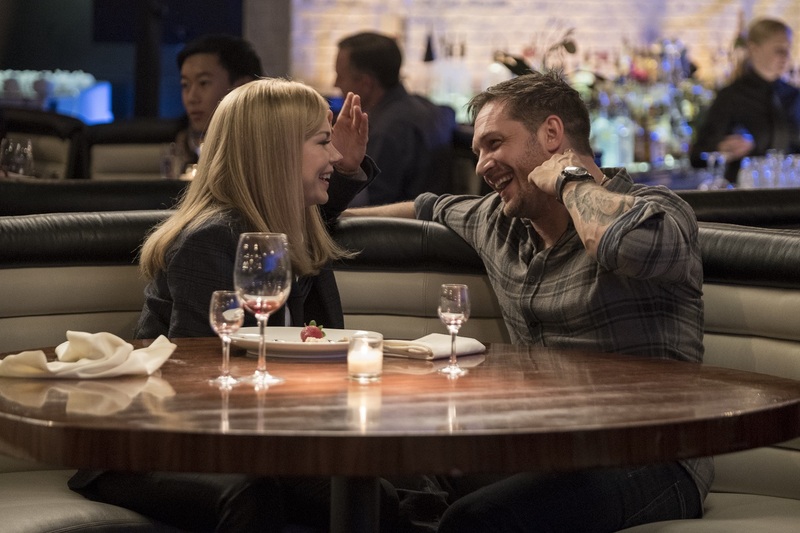 While Hardy’s weirdness is hit or miss with comedy both intentional and unintentional, he’s certainly the centerpiece of an otherwise bland movie. Riz Ahmed never comes off as the menacing villain he should be for a character who becomes so enraptured with alien science he sacrifices lives for his experiments. Michelle Williams is a complete waste as the romantic interest who has the most standard of additions to the plot, standing by in shock to watch Eddie transform and mostly get out of his way. And, of course, her character’s new doctor boyfriend is a real snooze, only present to spout more symbiote medical facts. As for the Venom personality, he’s nearly as hilarious as Brock himself, the deep and growling voice only sounding funnier the more this toothy and tongue-displaying creature tries to seem intimidating. Why so serious? © 2018 CTMG, Inc. All Rights Reserved. As much fun as it is to watch Hardy turn into a crazy with the alien voice inside his head, the film is still frustrating for being a tone-deaf mess. The Venom possession deal is goofy, but it contrasts sharply with the more horrific science experiment of the symbiotes, where established characters that include homeless people and struggling mothers are viciously murdered and then never spoken of again. Action scenes have interesting staging, as with an intense car chase featuring a motorcycle-bound Brock escaping pursuing hitmen, but they’re peppered with baffling moments of him outrunning suicidal drones. The whole purpose of the symbiotes is kept so aloof that their quick third-act explanations come off as mere shrugs and nothing all the interesting, finding slapped-together excuses to keep Venom biting off heads. And, seriously, was Hardy the only one who got the memo about this being a comedy considering how every other actor sleepwalks through this story? The key missing component that might have avoided making Venom an inky disaster would have been the inclusion of Spider-Man. With the webslinger present to encounter Venom, we could have had a snappy and fun film with these clashing personalities, which could make for great banter. But with nobody interesting to play against within this solo script, Tom Hardy seems lonely, holding a one-man show starring a babbling fool going for the gross. Without someone to sling him some zingers, Venom just looks embarrassing, flopping about in a movie where he begs for a punchline or someone to match his weirdness.